The first thing to know about Back to Basics in Cosy Cabins is that there is no electricity anywhere. The water is collected from a natural spring that comes up to the surface just next to the kitchen area. In the kitchen area, there are facilities to cook over open fire with pots, pans and a mesh for BBQs. There is even a large wood-fired oven for you to make pizzas in. It also has a “military refrigerator” (a special fridge that cools with ice blocks) to store your food and make sure it keeps. As for the spa area, there is one wood-heated sauna and two wood-heated bathing barrels (“badtunnor”). 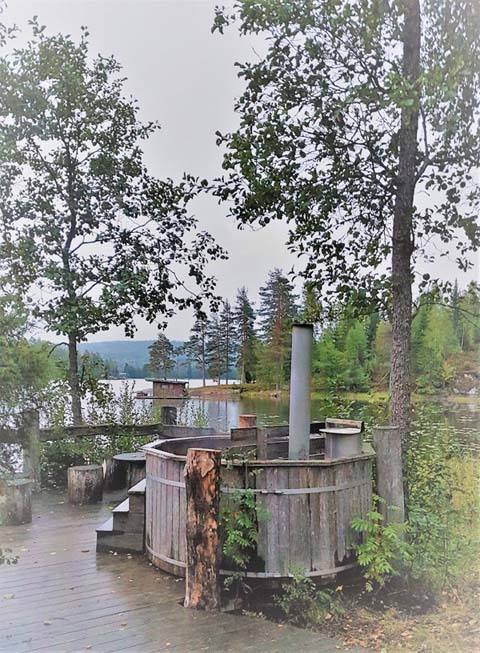 If you don’t want to wash yourself in the lake, there is a shower that you need to heat with wood and then pump while showering to get the pressure up. There are standard Swedish outdoor toilets that are lit by candles for when the nature calls. There are in total six cabins at Back to Basics: two tree-houses, three 4-bed cabins and the floating cabin, where I was going to spend the night. Except for one of the tree houses, all the cabins are heated with wood-burners and lit by paraffin lamps and candles. The socialising/eating building at Back to Basics. Photo: Sofia Carter Nature Travels. To get out to the floating cabin, you need to take one of the canoes that lies on the shore. 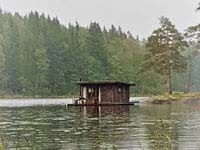 It’s a short paddle – just a couple of minutes – and at the floating cabin there are ropes with hooks that you just hook on to both ends of the canoe to moor it safely for the night. The Floating Cabin jetty with canoe moored alongside. Photo: Sofia Carter Nature Travels. 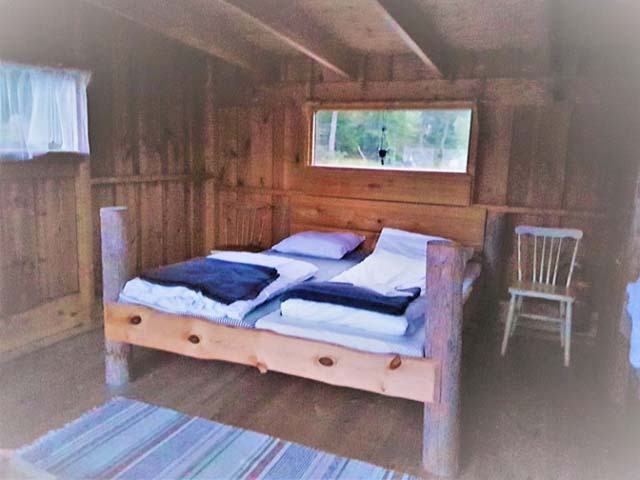 The cabin has one double bed and one sofa that can be made into a bunk bed, so in total a family of four could sleep there. It has a wood burner for heating and paraffin lamps and candles for light when the evenings get darker. There is a small outdoor toilet in one corner for when it’s needed, so no need to take the canoe ashore! 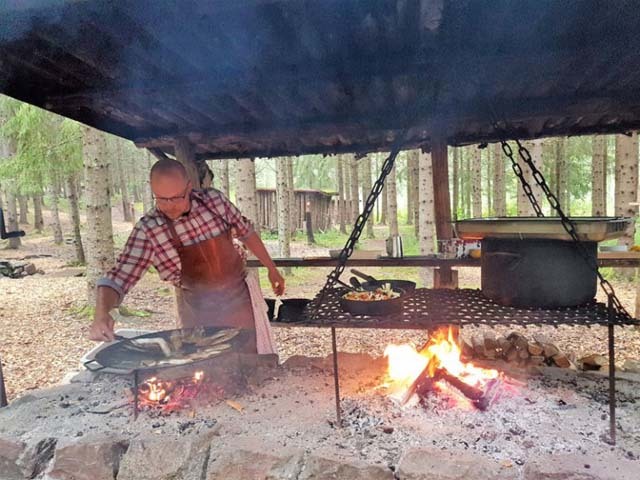 Preparing a meal over open fire. Photo: Nature Travels. 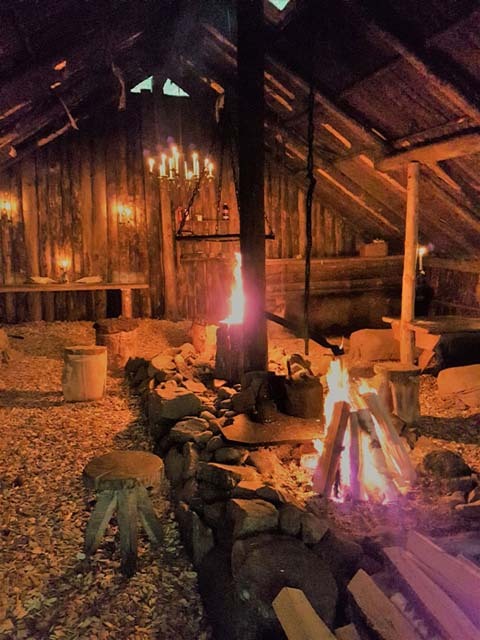 The cabin also has an outdoor cooking area and an ice fridge, so if you wanted to, you can stay out there the whole time and not go ashore at all. There is a small ladder leading from the jetty down into the water for those morning dips or sunset swims. As the time of my stay was the middle of September, it was dark when it was time for me to leave the “spa” area and take my canoe out to my cabin for the night. I had been out quickly to drop my luggage off previously, and thankfully remembered to bring my headtorch, which I was glad of when I now paddled out in the dark. A paraffin lamp had been lit on the jetty for me, which I was now aiming for, and in just a few minutes I landed my canoe against the jetty surrounding the cabin. 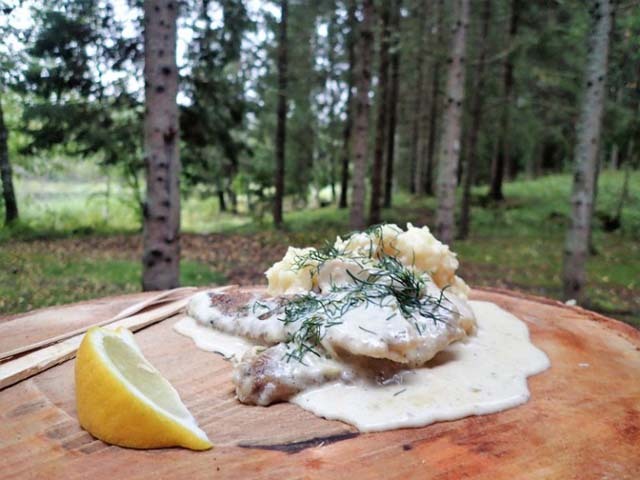 Simple yet delicious food in the forest! Photo: Sofia Carter Nature Travels. It was a calm night and the water was still. I felt like time had stopped. I changed into my sleeping clothes and went to sit on the edge of the jetty to brush my teeth. It wasn’t a clear night, but you could see the stars in the gaps between the clouds. It started to get chilly outside, so I headed inside. At first I considered lighting the wood burner, but then thought it would probably get the small cabin too warm, so opted for one of the blankets instead and drifted off to sleep. In the middle of the night I was woken up by a banging sound, as if someone had landed a canoe against the jetty, but I looked at my watch and realised it was only 5 am and that nobody would be out at this hour. 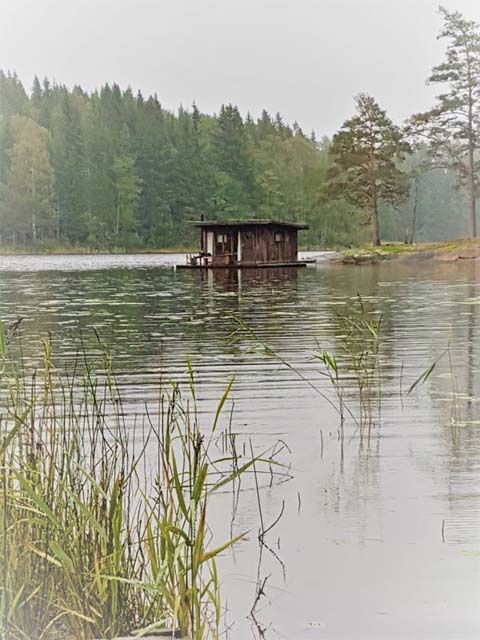 But just to be sure, I looked out through the windows (the cabin has one window on each side) and realised that the wind had picked up a bit and the sound I’ve heard was my own canoe softly hitting against the jetty. So I went back to bed and listened to the lapping of the small waves the wind created hitting the jetty. You could hear the “slap-slap” of the water, but the cabin wasn’t moving at all, and I slowly drifted off to sleep again. Beds in the Floating Cabin. Photo: Sofia Carter Nature Travels. At 7am my alarm went off and I reluctantly left the very comfortable bed and packed my stuff together, as I needed to meet the others on shore for breakfast soon. I packed my luggage into the canoe and as I paddled away I looked back at the cabin and thought that I really wished I was staying longer! 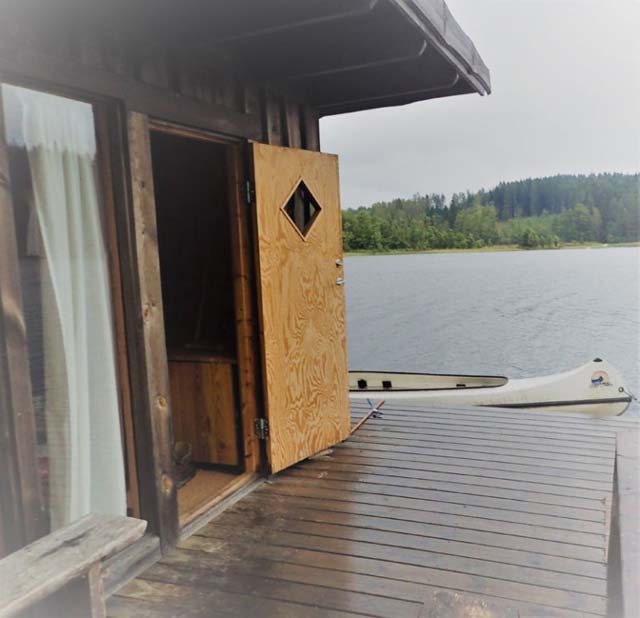 Back to Basics in Cosy Cabins is an ideal option as a stand-alone experience or in combination with one of our self-guided canoe tours or timber rafting tours in the area.